What are some things that may have led to the fading of Umbrella Movement’s effectiveness? The 79 days of protest may not have resulted in changes to the now defeated ‘fake democracy’ electoral reform proposal that was put forward to the Legislative Council in mid-2015 but in the longer term actually has and is continuing to be a strong influence in Hong Kong. One of the main reasons that led to the fading of effectiveness within the later stages of the 79-day protest was the rise of multiple voices both within and against the Umbrella Movement. The lack of pre-planning by the informal leaders of the protest resulted that it lacked a direction of movement and seemed only to be a reactionary voice to developments that were taking place around them. 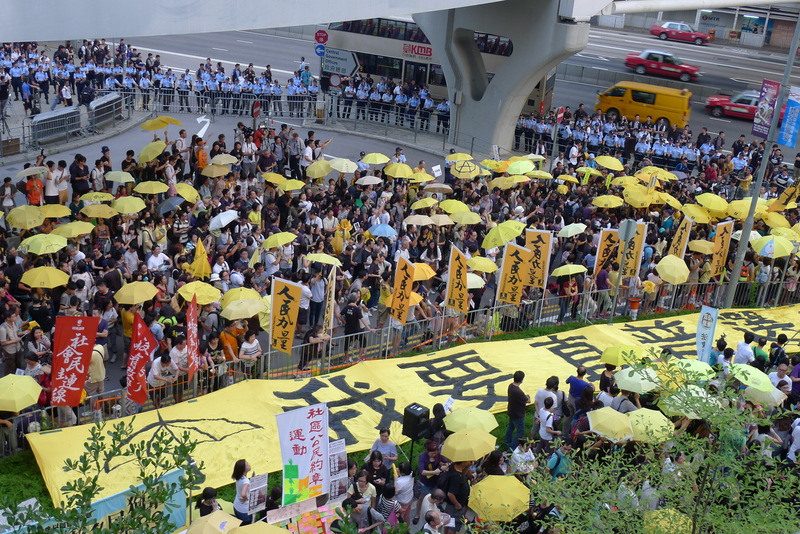 Also, the rise of anti-Occupy Central/anti-Umbrella Movement groups was a major test for the Umbrella Movement as it became subjected to critique, which in my opinion was fair and democratic. Some of the first protesters who took to the streets at the start of the Occupy Central/Umbrella Movement protests were also disheartened by the lack of perceived success and by the later quarter of the 79-day protest, numbers were well down at the protest sites around Hong Kong. Two of the terms most commonly used (or arguably misused) in the context of Occupy Central and the Umbrella Movement is ‘peace’ and ‘violence’. I believe that real ‘peace’ is more than just the absence of physical violence and that the ‘violence’ as seen in the Umbrella Movement was more a changing of norms as it was an unprecedented event that continues to have ramifications even today. Nearly all the parties involved in the Umbrella Movement, whether it be the protesters, students, government, Police and anti-Occupy activists tried to frame the events to their advantage. The usage of ‘peace’ and ‘violence’ in itself became a weapon of propaganda that was intended to swap public opinion to a particular side of the Umbrella Movement. The ambiguity of the ‘peace’ vs ‘violence’ speaks volumes to the subjective nature of the sociopolitical nature of the Hong Kong protests. Mass civil disobedience is ‘violence’ even though it may not have been physically violent as it disturbed the ‘peace’, that is being said without casting judgement on whether the Umbrella Movement is good or bad. A Journalist’s Reflection on the Umbrella Movement (Part 4) will be published next week.